Cash counters are a useful tool in organizing and identifying counterfeit currency. This is especially the case with international currency, which businesses may be unfamiliar with. Having a counter gives companies that work a lot with international customers the ability to handle their money in an efficient and trustworthy way. Currency is becoming increasingly complex in many countries, with features being added to help improve usability in various different ways. Among the changes that are being touted is tactile currency, which is being used to benefit the blind and visually-impaired. Australia is considered the next country to switch to tactile currency, according to ABC Online. A year-long campaign was started by 13-year-old Connor McLeod, born completely blind due to a congenital defect, to change the Australian dollar to have tactile features that distinguish the various denominations. Currently, the Aussie comes in different sizes, but the lack of distinguishing physical features by touch makes it difficult for those who are visually-impaired and use tactile identification to discern the different values. The Reserve Bank of Australia, in the process of creating the next generation of banknotes, announced that it will be adding a tactile feature that differentiates the notes. Other countries have led the way in tactile currency. For example, Canada offers a tactile system with the Canadian dollar. On the upper left corner of the Bank of Canada's current polymer series of banknotes is a series of six dots in the Braille format. The number and position of the series of dots determines the value of the currency. As NPR reported, the Federal Reserve and United States Mint have been considering adding tactile features to the American dollar. However, due to the complexity of changing the currency, it has provided for alternatives such as a subsidized reader and smartphone apps that can view and announce the currency for them. 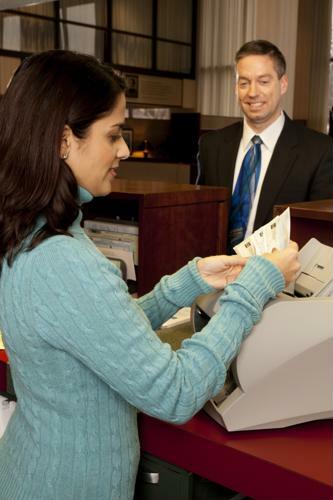 Cash counters are also an effective way of performing this measure.